We now tweet our clinics, competitions and events. Richard Carruthers Jumping Clinic photo album is now online. Photo courtesy of Horse Movement Photography. Situated within the grounds of Cheshire’s Arley Hall Estate we offer a unique equestrian facility for both competition and leisure riders. Our competition facilities include a 6 furlong all-weather circular gallop, floodlit indoor and outdoor arenas, all weather show jumping arena and cross country schooling fences. Our off-road estate ride is over 5 miles long with a number of optional routes giving you access to the otherwise privately owned Arley Hall Estate. Suitable for experienced and novice riders alike. Interesting or relaxing, it’s up to you. We offer both Full Livery and DIY Livery and welcome riders and owners of all abilities and offer 24 hour security for your horse. We produce our own high quality home-grown hay and haylage from specific horse hay grass seed varieties. Our completely dust free hay is unique. We have an on site rug laundry service. Most of all it’s a great place to be amongst friends who love working with horses. Retirement livery, youngstock livery and grass livery available on the private fields of the Arley Estate in Cheshire. Freshly rolled and rested fields available NOW. Groups are split into small groups of mares, geldings, youngsters and weanlings. Brood mares and foaling service also available, ring 07769 700 768 for details or to arrange a show round. Some small paddocks coming available for recuperation or rehabilitation. Full, Part, or DIY livery available shortly. Hurry! They won't be available for long. Email Richard richard@arleymossequestrian.co.uk or call 07973 549656 for more details. Stables available for either full, part or diy livery. 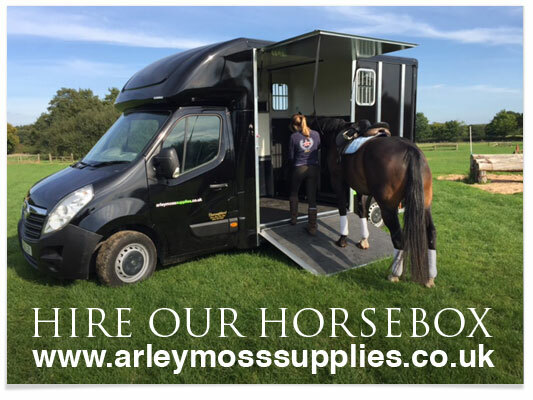 Email Richard (richard@arleymossequestrian.co.uk or call 07973 549656) if you would like to be put on our waiting list for DIY livery in Cheshire. Our bespoke full livery is tailored to suit your needs. Why not give us a call to discuss your requirements. If you would like to be put on our waiting list please contact richard@arleymossequestrian.co.uk. We provide exceptional services for those engaged in competition riding. Facilities include: A 6 furlong all weather gallop, 3 x 40m x 20m outdoor all weather arenas, an indoor arena, all floodlit. A 50m x 50m all weather showjumping arena, with permanent showjumps. A 60m x 20m grass dressage arena for competition practice and a cross country schooling course. A horsewalker and 2 exercise pens. Our family friendly yard is the perfect place for you and your horse or pony. With several, carefully thought out, off road rides across the stunning Arley Hall estate. you will find that you have plenty of opportunity to ride whatever your standard and whatever your aspirations. We are primarily a DIY livery yard however we offer the added bonus of offering bespoke, flexible services to help care for your horse. For those wanting a less hands on approach contact Richard to discuss other livery options. Our resident trainers, Di Hogg and Toby Blake are backed up by a team of visiting trainers, offering lessons and coaching for all ages and abilities. Our training clinics are open to both on and off yard riders. Full details are on the clinics page. Broodmare and foaling service All year round turnout. Youngstock a speciality. Send your horse to graze on the beautiful Arley Estate whilst they are growing up. Our youngstock are generally in groups according to age whilst the older horses are split into small groups of mares or geldings. Our 'state of the art' securty measures protect your horse and equipment 24/7 at Arley Moss Equestrian. Entry into the premises is protected by a perimiter alarm system and cctv surveylance cameras cover the whole yard. Locked and alarmed tack storage and 2 fully trained guard dogs add to the security here at Arley Moss Equestrian. Situated within the privately owned Arley Estate allows us unique, exclusive access. Being on the yard is about having fun with your horse amongst other people who feel exactly the same way. It really does feel like a family! Farriery and remedial farriery are available through Paul Gordon DipW.C.F and ATF (approved training farrier). As well as offering a top quality farriery service, Paul works closely with several veterinary practices to provide a remedial farriery service. permits. On-site equine osteopathy is available by Bruce Hewett. Bruce is a fully qualified osteopath with further post graduate qualifications and experience enabling him to practice equine osteopathy. Owners referred by their Vet are covered by their horse insurance policy. There are no short cuts to a great reputation so we work hard on building ours. Our 'can-do' attitude means we listen to you, and do our best to provide it. The result is that we have some great facilities and a constant schedule of improvements making sure they are always getting better.